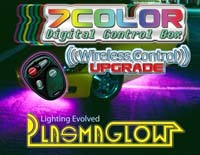 This upgrade comes with everything you need to convert your PlasmaGlow LED 7 Color Undercar Kit to wireless. Includes 2 keychain remotes that can turn your kit on and off, change the color and mode of your kit! Upgraded translucent control box with new modes and features. Features include: 7 color LED that displays the same color as your kit and a bank of LEDs that display every step of each mode of your kit, as it's happenning! Requires PlasmaGlow 7 Color LED Undercar Kit. Control your kit from up to 500 Feet away! Bring Wireless Control to your 7 Color Undercar Kit! This wireless upgrade was designed for the old 7 color changing LED undercar kit, but can still be used with the new 2.1M color LED undercar kit, but it will only display 7 colors. All necessary instructions and hardware are included to ensure a smooth installation and are backed up with the PlasmaGlow Liftime Warranty. $149.99USD On Special! This week only. Hurry! All products are shipped via Fed-Express to assure you a Speedy & Safe delivery. We process Visa & MasterCards through PayPal. If you're un-comfortable with using your credit card for online purchases, then please Click Here for other payment methods, otherwise, proceed below with your order. Wireless Upgrade LC- Back to Home Page.